I have a go-to appetizer for parties. It is always a sure fire hit, everyone wants to know what it is and there is never any left. Bonus, since it’s a Yankee dish and I live in the South, everyone thinks it is the most amazing thing ever… but have only had it when I have made it. This would be the opposite if we were in my hometown, because everyone he been eating it there for ages. 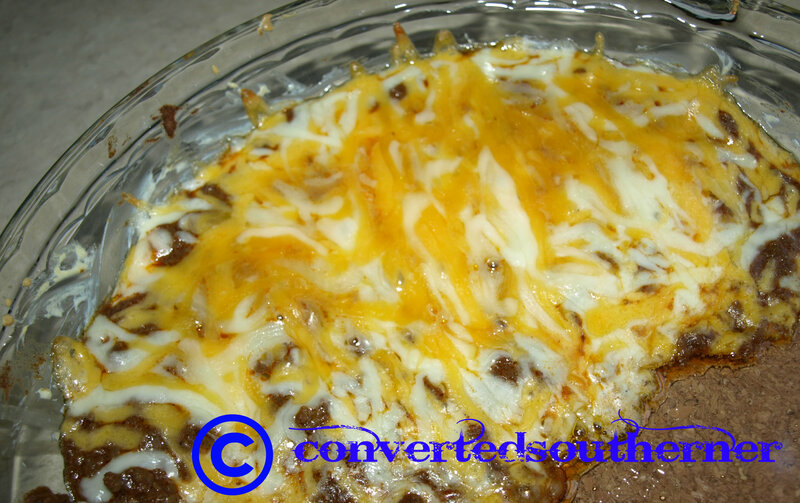 It is the most amazing… Chili Cheese Dip. Heaven in a baking dish. 3) Spread cream cheese over bottom of baking dish…. You can use just about any size. 5) Sprinkle shredded cheese on top of chili- evenly. 6) Bake for 20 minutes, or until bubbly on edges. 7) Serve warm with chips of choice. When I am going to a party now I usually pre-make this in a disposable pan and heat it at the party. Easy to clean up and then it is hot when eating. I really am obsessed. And I can’t tell you then number of people I know that live down here that make it now for parties! Give it a try! So good!